Do adjunct tuberculosis tests, when combined with Xpert MTB/RIF, improve accuracy and the cost of diagnosis in a resource-poor setting? Information regarding the utility of adjunct diagnostic tests in combination with Xpert MTB/RIF (Cepheid, Sunnyvale, CA, USA) is limited. We hypothesised adjunct tests could enhance accuracy and/or reduce the cost of tuberculosis (TB) diagnosis prior to MTB/RIF testing, and rule-in or rule-out TB in MTB/RIF-negative individuals. We assessed the accuracy and/or laboratory-associated cost of diagnosis of smear microscopy, chest radiography (CXR) and interferon-γ release assays (IGRAs; T-SPOT-TB (Oxford Immunotec, Oxford, UK) and QuantiFERON-TB Gold In-Tube (Cellestis, Chadstone, Australia)) combined with MTB/RIF for TB in 480 patients in South Africa. When conducted prior to MTB/RIF: 1) smear microscopy followed by MTB/RIF (if smear negative) had the lowest cost of diagnosis of any strategy investigated; 2) a combination of smear microscopy, CXR (if smear negative) and MTB/RIF (if imaging compatible with active TB) did not further reduce the cost per TB case diagnosed; and 3) a normal CXR ruled out TB in 18% of patients (57 out of 324; negative predictive value (NPV) 100%). When downstream adjunct tests were applied to MTB/RIF-negative individuals, radiology ruled out TB in 24% (56 out of 234; NPV 100%), smear microscopy ruled in TB in 21% (seven out of 24) of culture-positive individuals and IGRAs were not useful in either context. In resource-poor settings, smear microscopy combined with MTB/RIF had the highest accuracy and lowest cost of diagnosis compared to either technique alone. In MTB/RIF-negative individuals, CXR has poor rule-in value but can reliably rule out TB in approximately one in four cases. These data inform upon the programmatic utility of MTB/RIF in high-burden settings. Xpert MTB/RIF (Cepheid, Sunnyvale, CA, USA) is an accurate molecular test for the diagnosis of tuberculosis (TB). The World Health Organization (WHO) recently endorsed MTB/RIF for rapid implementation as a frontline test in individuals suspected of HIV/TB co-infection [1, 2]. The performance of a single MTB/RIF has been prospectively assessed in over 7,500 patients from a variety of settings [3, 4], where its sensitivity in smear-positive and smear-negative individuals was found to be ∼98% and ∼75%, respectively, with overall excellent specificity (∼99%) and good predictive value (positive predictive value (PPV) ∼97%, negative predictive value (NPV) ∼96%). Although repeated MTB/RIF testing offers small improvements in diagnostic accuracy [3, 4], the test remains expensive and is likely to be performed in routine care only once per patient [1, 2]. Given resource constraints in high-burden settings, national TB programmes need to make important policy decisions on the positioning of MTB/RIF within existing diagnostic algorithms. Few data about the performance and cost of MTB/RIF in combination with adjunct tests are available to guide policymakers. Additionally, given the diminished NPV of a single MTB/RIF in HIV-infected individuals (∼91%; therefore, approximately one in 10 HIV-infected, MTB/RIF-negative individuals have TB) [4–6], combined with the unavailability of culture facilities in many HIV-prevalent settings, there is a need to assess the performance of adjunct tests for ruling-out TB in HIV-infected individuals who are MTB/RIF negative. There are limited studies evaluating the cost of diagnosis of MTB/RIF alone or in conjunction with adjunct tests for the diagnosis of TB. Recent articles [7, 8], including a WHO policy document pertaining to the roll-out of MTB/RIF , have highlighted the urgent need for research in this area. In addition to assessing the diagnostic accuracy of certain adjunct TB tests, we performed a cost analysis to determine the laboratory-based cost of diagnosis of these tests when combined with MTB/RIF alone. We recently assessed the performance of a single MTB/RIF assay in archived spot sputum samples collected from 496 self-reporting patients with suspected TB. Patients were consecutively recruited from primary care clinics in a high HIV prevalence setting in Cape Town, South Africa [5, 9]. Liquid culture positivity for Mycobacterium tuberculosis from a single sample served as a reference standard. Informed consent was obtained from all participants and the study was approved by the University of Cape Town Faculty of Health Sciences Research Ethics Committee (Cape Town). Detailed demographic and clinical information, as well as MTB/RIF performance data, have been published previously for this cohort . Each patient was allocated to one of three diagnostic categories. 1) Definite TB: a clinical presentation compatible with TB with at least one sputum sample smear positive or culture positive for M. tuberculosis. 2) Probable TB: a clinical-radiological picture highly suggestive of TB and/or anti-TB treatment was initiated by an attending clinician based on clinical suspicion but the patient did not meet the criteria for definite TB (smear negative and no culture-based evidence of M. tuberculosis). 3) Non-TB: no evidence of TB based on smear microscopy and culture, no anti-TB treatment initiated with response to alternative treatment where appropriate and, when available, no radiological evidence to support the diagnosis of TB. Each patient gave two spot sputum samples and one early-morning sputum sample (the latter provided no longer than 1 week after the initial visit) (fig. 1). An arbitrarily selected spot sputum sample was stored at -20°C for later MTB/RIF analysis. The MTB/RIF procedure has been detailed previously [3, 10]. The remaining samples were used for concentrated fluorescent smear microscopy and cultured using the BACTEC MGIT 960 system (BD Diagnostics, Franklin Lakes, NJ, USA). Where possible, a chest radiograph (CXR), read by two investigators using the validated CXR scoring and recording system (CRRS) [11, 12], and standardised interferon-γ release assays (IGRAs), T-SPOT.TB (Oxford Immunotec, Oxford, UK) and QuantiFERON-TB Gold In-Tube (QFT-GIT; Cellestis, Chadstone, Australia) were performed. Patient flow diagram and diagnostic outcomes stratified by final diagnostic category. TB: tuberculosis; CXR: chest radiograph; CRRS: CXR scoring and recording system; QFT-GIT: QuantiFERON-TB Gold In-Tube (Cellestis, Chadstone, Australia); MGIT: mycobacteria growth indicator tube. T-SPOT-TB is manufactured by Oxford Immunotec Ltd, Oxford, UK. #: CXR data missing in 156 patients. ¶: T-SPOT.TB data missing in 130 patients and an indeterminate result in nine patients. +: QFT-GIT data missing in 91 patients and an indeterminate result in 44 patients. §: in this group: all 106 individuals with CXR data had a CXR compatible with active TB; 91 (85%) out of 107 individuals with T-SPOT.TB had a positive result; 49 (46%) out of 106 individuals with QFT-GIT had a positive result. ƒ: in this group: 161 (97%) out of 166 individuals with CXR data had a CXR compatible with active TB; 72 (57%) out of 127 individuals with T-SPOT.TB data had a positive result; 75 (61%) out of 123 individuals with QFT-GIT data had a positive result. ##: in this group: none of the 78 individuals with CXR data had a CXR compatible with active TB; 60 (57%) out of 106 individuals with T-SPOT.TB data had a positive result; 66 (58%) out of 113 individuals with QFT-GIT data had a positive result. We assessed the diagnostic accuracy of adjunct tests (alone and in combination with MTB/RIF) when used to pre-screen individuals for MTB/RIF testing (table 1). Differences in diagnostic accuracy between strategies are outlined in table S3. We also assessed the diagnostic utility of these adjunct tests for the detection of TB in MTB/RIF-negative individuals (table 2). For the analysis of test sensitivity, culture positivity from any sample (spot or morning) served as a reference standard. Individuals who were culture negative for all samples (from the probable or non-TB group) were used in specificity calculations. Comparative performance data were obtained when the analysis was restricted to individuals classified as non-TB (i.e. probable TB excluded from the culture-negative group) (tables S1 and S2). Test performance assessment and Chi-squared analyses were performed using OpenEpi version 2.3.1 . The cost analysis was performed from a healthcare provider perspective and limited to the laboratory-associated costs of diagnosis (table 3). Results of the cost analysis stratified by HIV status are shown in tables S6 and S7 of the supplementary material. 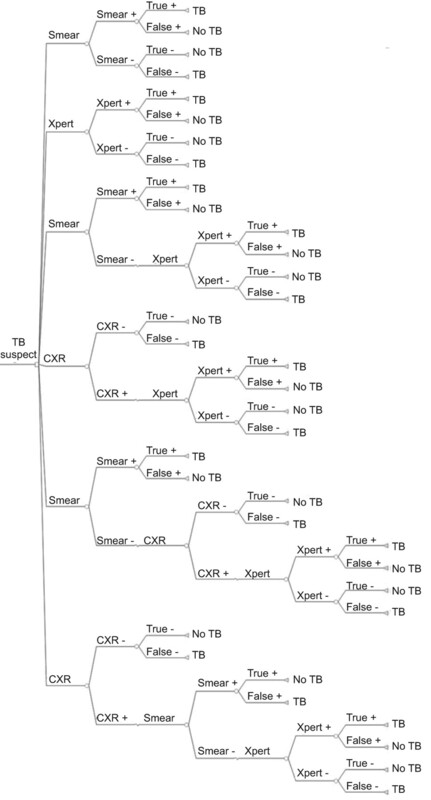 A decision tree model was used to determine the outcomes and costs of using MTB/RIF, either on its own or in combination with other pre-screening tests (smear microscopy and/or CXR), for the diagnosis of TB (fig. 2) . IGRAs were not included due to their poor clinical utility for ruling-in or ruling-out patients for MTB/RIF testing. The model was run on a hypothetical cohort of 1,000 TB patients normalised to our clinical performance data (table 1). Additional costs associated with clinic visits, TB treatment or drug sensitivity testing were not considered in this analysis. Actual smear microscopy and CXR costs were taken from reference laboratory sources (table S4) and correspond to those reported elsewhere . The actual cost of performing an MTB/RIF test was calculated using WHO estimates  and data specific to South Africa (table S5). Costs are presented in US$ according to the currency conversion rate of 2011. The number of cases (TB and non-TB) and the cost per TB case detected compared to the baseline of screening with smear microscopy were reported. A univariate and a multivariate sensitivity analysis were also performed. The costing and sensitivity analyses methodologies are described in the supplementary material. A decision tree for the diagnosis of tuberculosis (TB) using six different screening strategies. 1) Smear microscopy alone. 2) Xpert MTB/RIF (Xpert) alone. 3) Smear microscopy followed by Xpert (performed if smear negative). 4) Chest radiograph (CXR) followed by Xpert (performed if the CXR is suggestive of TB). 5) Smear microscopy followed by CXR (performed if smear negative) and Xpert (performed if CXR is suggestive of active TB). 6) CXR followed by smear microscopy (performed if CXR is suggestive of active TB) and Xpert (performed if smear negative). TB and non-TB outcomes refer to an initial diagnosis based on a single or combination test result. Square node: decision branches; circular nodes: chance branches; triangular nodes: terminal branches. Data modified from . Does pre-screening with adjunct diagnostic tests improve MTB/RIF performance and/or the cost of TB diagnosis? Smear microscopy had a good rule-in value for TB (sensitivity, specificity and PPV were 69% (102 out of 149), 99% (328 out of 331) and 97% (102 out of 105), respectively) (table 1). A combination of smear microscopy and MTB/RIF (performed if smear negative) had better overall sensitivity than smear-microscopy alone (82% (95% CI 75–87%), 122 out of 149 versus 69% (61–75%), 102 out of 149; p<0.01) but did not outperform MTB/RIF alone (77% (115 out of 149); p=0.32). Using smear microscopy to pre-screen individuals with suspected TB prior to MTB/RIF testing reduced the cost to detect a TB case by $115 compared to MTB/RIF alone ($401 versus $516) (table 3). The sensitivity and NPV of CXR in our cohort were both 100% (n=106 and 57, respectively) (table 1). Thus, of the 324 individuals who had CXR data, 18% (n=57) could have been ruled out as non-TB prior to MTB/RIF testing. The predictive value of CXR combined with MTB/RIF (performed only in individuals with a CXR compatible with active TB) did not significantly differ compared to MTB/RIF alone (PPV 92% (82 out of 89) versus 89% (115 out of 130) for MTB/RIF alone (p=0.38); NPV 90.0% (211 out of 235) versus 90.3% (316 out of 350) for MTB/RIF alone (p=0.84)). Consequently, this strategy (pre-screening with CXR prior to MTB/RIF testing) had a higher cost per detected TB case than MTB/RIF alone ($698 versus $516 per TB case detected) (table 3). Smear microscopy followed by CXR and MTB/RIF (i.e. MTB/RIF performed only on smear-negative individuals with a CXR compatible with active TB) had similar diagnostic accuracy to other strategies involving a combination of tests: smear microscopy followed by MTB/RIF, CXR followed by MTB/RIF, CXR followed by smear microscopy, and MTB/RIF (sensitivity, specificity, PPV and NPV for the smear microscopy/CXR/MTB/RIF strategy of 83% (88 out of 106), 96% (210 out of 218), 92% (88 out of 96) and 92% (210 out of 228), respectively) (table 1). Both combined strategies (i.e. smear, CXR and MTB/RIF, or CXR, smear and MTB/RIF) detected an equivalent number of TB cases (59.05 TB cases per 1,000 screened) (table 3). However, the cost per case detected of the latter strategy was higher ($531 versus $401 per TB case detected). This is because more individuals required an upfront CXR, which is more expensive per test than smear microscopy. Both strategies were still more costly than smear microscopy followed by MTB/RIF. As outlined in table 1, IGRAs (T-SPOT.TB and QFT-GIT) had sub-optimal sensitivities (∼85% each; 91 out of 107 and 90 out of 106, respectively) and sub-optimal NPV (∼85% each; 102 out of 118 and 96 out of 112, respectively). The cost per TB case detected in the HIV-infected cohort for each strategy was much lower than in the HIV-uninfected cohort (tables S6 and S7). This is primarily due to the poorer performance of smear microscopy in HIV-infected patients, which consequently increases the number of cases detected by downstream adjunct tests. As a result, screening with MTB/RIF alone had the second lowest cost per TB case detected (after performing MTB/RIF in smear-negative individuals) in the HIV-infected cohort ($202 per TB case detected) but the highest in the HIV-uninfected cohort ($1,446 per TB case detected). The strategies combining all three techniques (smear microscopy, CXR and MTB/RIF) had the lowest costs per TB case detected in the HIV-uninfected group ($427 per TB case detected when pre-screening with smear microscopy followed by CXR versus $566 when pre-screening with CXR followed by smear microscopy). A univariate sensitivity analysis revealed that the cost rankings, in terms of the cost per TB case detected, were most sensitive to changes in MTB/RIF test cost and the sensitivity of the baseline strategy (smear microscopy alone), as well as that of MTB/RIF (either on its own or in combination with other pre-screening tests) (table S8). In most cases, increasing the sensitivity of a particular strategy made that strategy the least costly in terms of TB cases detected. For example, when MTB/RIF sensitivity in the MTB/RIF alone strategy was increased to 90%, this strategy detected more TB cases and consequently had the lowest cost ($209 per TB case detected). Conversely, lowering MTB/RIF sensitivity to 65% results in this strategy detecting fewer TB cases than with smear microscopy alone. Increasing TB prevalence decreased the cost per TB case detected for each strategy due to an increase in TB cases detected, but did not significantly change the cost ranking of the strategies. However, in many cases, performing smear microscopy followed by MTB/RIF remained the least costly strategy. When a multivariate sensitivity analysis was performed (table S9) using smear microscopy and MTB/RIF diagnostic accuracy data from a larger study by Boehme et al. (MTB/RIF sensitivity of 90% (933 out of 1,033) versus 77% (115 out of 149) for our study), screening with MTB/RIF alone ($191 per TB case detected) was less costly than a combination of smear microscopy and MTB/RIF ($222 per TB case detected) and smear microscopy followed by CXR and MTB/RIF ($270 per TB case detected). This was primarily due to the improved diagnostic accuracy of MTB/RIF in the larger study, which resulted in a lower cost per TB case detected. The cost ranking of other strategies remained unchanged. Do adjunct tests possess diagnostic utility for ruling out TB in MTB/RIF-negative individuals? Of 73% (350 out of 480) of patients with a negative MTB/RIF result, ∼10% (n=34) had culture-confirmed TB and approximately half of these (15 out of 31) were HIV infected (three had no HIV data). Detailed performance data for each test in MTB/RIF-negative patients is shown in table 2. 21% (seven out of 34) of the MTB/RIF-negative, culture-positive group were smear positive. Thus, 5% (seven out of 149) of culture-positive samples were MTB/RIF-negative but smear positive. The sensitivity and NPV performance of CXR for ruling-out TB in MTB/RIF-negative individuals were 100% (n=24) and 100% (n=56), respectively. Thus, 24% of the MTB/RIF-negative individuals who received a CXR (56 out of 234) could be ruled out as non-TB by the presence of a normal CXR. The proportion of individuals who had a normal CXR did not differ by HIV status (21% (26 out of 123) of HIV-uninfected versus 22% (14 out of 67) of HIV-infected individuals; p=0.97). All smear-positive individuals had a CXR compatible with active TB and, thus, CXR performance did not improve when combined with smear microscopy (table 1). IGRAs had moderate performance for ruling out TB in MTB/RIF-negative individuals (NPV: 93% (98 out of 105) and 94% (94 out of 99) for T-SPOT.TB and QFT-GIT, respectively) but suboptimal clinical utility (sensitivity ∼75% in each). A single frontline MTB/RIF test has been endorsed by the WHO and is currently in the process of being rolled out in resource scarce settings. However, a recent WHO global consultation on the rapid implementation of MTB/RIF has highlighted the need for research investigating the utility of adjunct tests in the diagnostic pathway . Adjunct tests may have cost saving utility when used to pre-screen TB suspects for MTB/RIF testing without compromising overall diagnostic accuracy. They may also be useful in MTB/RIF-negative individuals to guide further patient management. There are currently no published data on how adjunct tests may be combined with MTB/RIF or their impact on the overall cost of diagnosis. The key findings of our study were as follows. 1) Smear microscopy followed by MTB/RIF (performed if smear negative) had a lower cost of diagnosis than MTB/RIF alone. 2) Approximately one in four MTB/RIF-negative individuals has a normal CXR (using the validated CRRS system) [11, 12] and all of these individuals are culture negative; thus, CXR can be used to reliably rule-out TB in MTB/RIF-negative individuals. 3) CXR can reliably rule out TB in approximately one in five TB suspects prior to MTB/RIF testing but is still more costly than performing MTB/RIF alone or the combination of smear microscopy and MTB/RIF. 4) Adjunctive diagnostic strategies can be less costly per TB case detected than a single upfront MTB/RIF. In order of increasing cost: smear microscopy followed by MTB/RIF (performed if smear negative); smear microscopy followed by CXR (performed if smear negative), followed by MTB/RIF (performed if the CXR is compatible with active TB); MTB/RIF alone; CXR followed by smear microscopy (performed if CXR is suggestive of active TB) and MTB/RIF testing (performed if smear negative); and, finally, CXR followed by MTB/RIF (performed if CXR is suggestive of active TB). However, this ranking is sensitive to baseline MTB/RIF performance. 5) IGRAs have little utility as a pre-screening tool for MTB/RIF testing. Pre-screening individuals with smear microscopy followed by MTB/RIF (performed if smear negative) was more cost-effective than MTB/RIF alone. A key advantage of this approach is that the potential of same-day diagnosis may be retained, although the feasibility will be setting specific. Thus, given that smear microscopy facilities already exist or are immediately accessible to many primary care clinics in resource-scarce settings, it might be more suitable to target MTB/RIF at smear-negative individuals; however, this requires prospective validation. A major disadvantage of this approach is the lack of drug resistance testing for smear-positive individuals, thus, perhaps limiting this strategy to areas with a low prevalence of drug-resistant TB or to individuals not suspected of drug-resistant TB. A normal CXR, by contrast, could reliably exclude TB in ∼20% of cases prior to MTB/RIF testing and, although the caveat of drug-resistance testing would not apply, the applicability of this finding is restricted by the limited nature of radiology facilities and trained readers in resource-scarce settings. In MTB/RIF-negative individuals, smear microscopy retained some utility and was able to detect ∼20% of TB cases. CXR was able to reliably rule out TB in approximately one in four MTB/RIF-negative individuals and, thus, is useful for the downstream investigation of MTB/RIF-negative individuals. Although the NPVs of IGRAs were relatively high in this study, the NPV of IGRAs in unselected persons with suspected TB  and in HIV-infected persons with smear-negative TB  in high-burden settings is sub-optimal and, in line with the recent WHO guidelines about IGRAs in TB-endemic countries , we would not recommend their use in this context. Furthermore, their cost and incompatibility with same-day diagnosis are major caveats, especially given that patient non-return rates for follow-up test results are significant . Our cost analysis used a simple decision tree model to compare the short-term laboratory-associated costs of correctly diagnosing TB using different MTB/RIF-based diagnostic strategies, making it of interest to policy makers who prefer to examine how implementation of a new clinical intervention affects their annual budget, rather than long-term costs. We did not include further downstream costs related to TB treatment and transmission. Costs associated with misdiagnosing patients, such as increased transmission and morbidity, together with the unnecessary use of TB treatment can be significant. Thus, the lack of morbidity and mortality data for our cohort is a major limitation of our cost analysis. Our model did not account for potential cost benefits arising from the drug susceptibility testing capability of MTB/RIF. Given that our data was generated using the first-generation cartridge and an intermediate version of the software (which is being modified to improve the PPV of the rifampicin resistance result), as well as the limited number of rifampicin resistant cases, this would have been of limited conclusiveness. Furthermore, many of the cost benefits associated with drug resistance detection will probably be incurred in terms of reduced TB transmission, which is outside the scope of this model. Additionally, there is very limited capacity to diagnose or treat multidrug-resistant TB in Africa (WHO currently recommends a confirmatory phenotypic test when MTB/RIF indicates drug resistance) and, thus, cost analyses for this variable is likely to vary considerably on a setting-by-setting basis. Our economic analysis, whilst not a true cost-effectiveness analysis, aims to inform future detailed cost-effectiveness studies on MTB/RIF focusing on inclusion of the long-term costs associated with these strategies, including TB treatment, drug susceptibility testing, wider TB transmission to the community and those from a patient perspective. There are several additional limitations of our study. We had limited data for all tests, including CXR, on each patient (either the test was not performed or the data were missing), thereby restricting our test-specific sample size and the conclusiveness of our findings. This was also limited by the use of archived specimens for MTB/RIF. Additionally, the relevance of CXR when used in combination with smear microscopy and/or MTB/RIF is limited by the lack of radiology facilities being available in resource-scarce settings. The high NPVs of CXR will be modulated by the degree of immunosuppression and findings may differ in settings where HIV-infected patients present with lower CD4 counts. Thus, findings presented here may not be applicable to low HIV prevalence, resource-poor settings, or those in which patients have more advanced immunosuppression at presentation. Our use of concentrated fluorescence smear microscopy, which is not available in many resource-poor settings, also affects the generalisability. Our findings now require prospective validation in diagnostic trials. In summary, we have shown that smear microscopy combined with MTB/RIF (performed if smear negative) had the lowest cost per TB case detected. Furthermore, we have shown that radiology can be a useful tool for ruling-out TB in MTB/RIF-negative individuals. Further prospective studies and cost-effectiveness analyses are now required to assess the performance and cost benefits of these strategies. This work was supported by an EU-FP7 award (TBsusgent). The Xpert MTB/RIF cartridges were a gift from the Foundation for Innovative New Diagnostics (FIND; Geneva, Switzerland). The FIND had no input into the design of the study, analysis of the data or preparation of the manuscript. G. Theron was supported by the European and Developing Countries Clinical Trials Partnership (EDCTP) TB-NEAT, the Claude Leon Foundation and the South African National Research Foundation. A. Pooran and J. Peter were supported by a South African TB/AIDS Research Training fellowship. R. van Zyl-Smit and J. Peter were supported by a Discovery Foundation Fellowship, the Fogarty International Clinical Research Scholars/Fellows Support Centre National Institutes of Health grant (R24TW007988) and the EDCTP (TB-NEAT). K. Dheda was supported by the EDCTP (TB-NEAT/TESA), the South African Department of Science and Technology and the National Research Foundation (South African Research Chairs Initiative). World Health Organization. Automated real-time nucleic acid amplification technology for rapid and simultaneous detection of tuberculosis and rifampicin resitance: Xpert MTB/RIF System. WHO/HTM/TB/2011.4. Geneva, World Health Organization, 2011. World Health Organization. Rapid Implementation of the Xpert MTB/RIF diagnostic test. Technical and Operational “How to” Practicle Considerations. WHO/HTM/TB/2011.2. Geneva, World Health Organization, 2011.
. Feasibility, diagnostic accuracy, and effectiveness of decentralised use of the Xpert MTB/RIF test for diagnosis of tuberculosis and multidrug resistance: a multicentre implementation study. Lancet 2011; 377: 1495–1505.
. Evaluation of the Xpert MTB/RIF assay for the diagnosis of pulmonary tuberculosis in a high HIV prevalence setting. 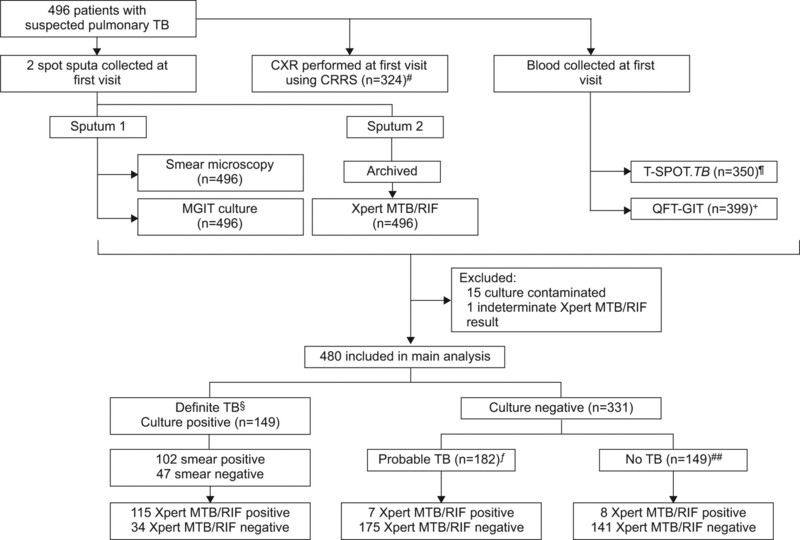 Am J Respir Crit Care Med 2011; 184: 132–140.
. Xpert MTB/RIF test for tuberculosis. Lancet 2011; 378: 481.
. Is scale-up worth it? Challenges in economic analysis of diagnostic tests for tuberculosis. PLoS Medicine 2011; 8: e1001063.
. GeneXpert – a game-changer for tuberculosis control? PLoS Med 2011; 8: e1001064.
. The use of an automated quantitative polymerase chain reaction (Xpert MTB/RIF) to predict the sputum smear status of tuberculosis patients. Clin Infect Dis 2012; 54: 384–388.
. Rapid detection of Mycobacterium tuberculosis and rifampin resistance by use of on-demand, near-patient technology. J Clin Microbiol 2010; 48: 229–237.
. Chest radiograph reading and recording system: evaluation for tuberculosis screening in patients with advanced HIV. Int J Tuberc Lung Dis 2010; 14: 52–58.
. Development and evaluation of a new chest radiograph reading and recording system for epidemiological surveys of tuberculosis and lung disease. Int J Tuberc Lung Dis 2005; 9: 1088–1096.
. OpenEpi: Open Source Epidemiologic Statistics for Public Health, Version 2. 3.1. www.OpenEpi.com Date last updated: September 19, 2010. Date last accessed: November 30, 2010.
. Cost and cost-effectiveness of community-based care for tuberculosis in Cape Town, South Africa. Int J Tuberc Lung Dis 2003; 7: Suppl. 1, S56–S62.
. Are interferon-γ release assays useful for diagnosing active tuberculosis in a high-burden setting? Eur Respir J 2011; 38: 649–656.
. Interferon release does not add discrimiatory value to smear negative HIV-tuberculosis algorithms. Eur Respir J 2012; 39: 163–171. World Health Organization. Commercial Serodiagnostic Tests for Diagnosis of Tuberculosis. WHO/HTM/TB/2011.5. Geneva, World Health Organization, 2011.
. The effect of diagnostic delays on the drop-out rate and the total delay to diagnosis of tuberculosis. PloS One 2008; 3: e1933. You are going to email the following Do adjunct tuberculosis tests, when combined with Xpert MTB/RIF, improve accuracy and the cost of diagnosis in a resource-poor setting?